This is not being brave. This is not something we want to do. This is the only option we have. I couldn’t figure out if I wanted to title this post “The End” or “The Beginning” – so I went with “The Middle” and that ended up feeling just right. I had not witnessed a person dying until I was there with Vanessa for her body’s last breath. It’s a single, holy moment. Mom and Dad had, of course, also witnessed the single moment of her birth, her body’s very first breath. The life, the here and the now, this long middle between birth and death, is what we have to figure out moment by moment. Vanessa’s beginning, middle and end have all been in my middle. 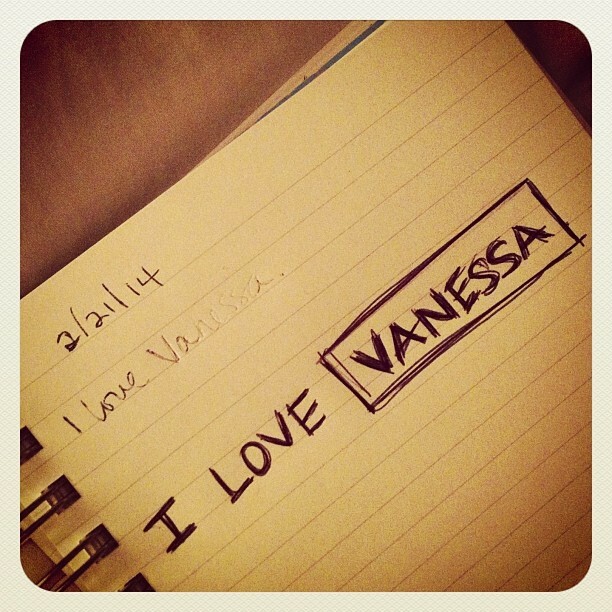 My middle continues on, even as Vanessa has ended…. which feels just unfathomable to my brain, but is the case. My mom continues to live, after her daughter has died. Billy continues to go about his days, now a widow. I continue to laugh, to cry, to watch my children grow, to work, and to play, all in this new life where Vanessa is not alive. Christina and I continue to be sisters, the oldest and the youngest of our sisterly trio that now has a Vanessa-shaped hole… right in the middle of us. This situation is not a choice. This is not being brave. This is not something we want to do. This is not easy, nor is it enjoyable. This is the only option we have. Our middle carries on past Vanessa’s end. This is the inescapable truth of it, a truth we did not choose but which reminds us of how much we don’t get to choose in this life. Our truth contains this, now: One (sister-in-the-)middle is gone. Our own (breaths-between-the-first-and-last-)middles are continuing. Christina and I started this website, this blog, this project, to include a legacy of Vanessa that is far bigger than any one person, but also as a place for us to share our struggles and triumphs in navigating this life, in general – the grief that is life without Vanessa, as well as all the other facets of a life that (like for all of is) is complicated and prickly and both murky and clear. We never imagined our blogging would end up containing so much of Vanessa’s story unfolding, too – anyone who has been following along thus far is well aware of how much longer the hospice chapter took than expected! I am grateful that extra time allowed us to have a record of some of our thoughts and feelings around her last years, on top of the additional precious good time we were often able to spend with later versions of our Vanessa, although it also changed our grief to a much longer, slower trajectory than we expected. Now our posts will change a bit, too, by necessity. We now are hopping the tracks here, then, from “caregiving” centered activities and thoughts, to “grief” and “non-Vanessa” centered ones – and this widening of topics has been the cause of a lot of my writing and posting silence, honestly. Writing a Vanessa update or even caregiver update post is something I am familiar and comfortable with, by now… whereas writing about non-Vanessa-alive things, about the spaces around where she was/is, about my own thoughts not as seen reflected back in her living eyes… well, that’s pretty new. What makes me feel more confident in carrying on is the frequent conversation topic of Christina and me – knowing that we’ve been figuring this out as we go all along, so in that sense, this isn’t new. While being handed these cards does not automatically make one brave, we feel it IS brave to chose to explore all of this in a transparent way. We are not experts or professionals in this, but we can reflect with sincerity and honesty (both to ourselves and publicly). So it hopefully goes without saying, but Christina and I have every intention of continuing to write and think and share here. We have lots more caregiving thoughts to unravel yet, as well as insights from the newest stops on this grieving train ride we started on months and even years ago. We believe that every person’s story is important, and our truths and lessons are universal. I know Vanessa will never be far away in my thoughts, whether she surfaces in the words of a particular blog post or not – but it’s also freeing to feel we can explore into our own hearts a bit more fully now. I think it’s be safe to say we’ve been in something of a “silence of disbelief” since Vanessa’s death, which itself feels unbelievable, when we so clearly knew this was coming… but even though logistically it was anticipated and I factually accept it, Vanessa being gone now emotionally feels unreal, still, all the same, all the time. Thank you for your continued presence here and in person, and the support and lessons you have graced us with thus far. Christina and I can’t wait to share with you, when we are able to push our broken hearts back out onto the stage, all the many ideas we are truly excited about, even through our grief: project assignments to give (remember those? we have tons more ideas! ), caregiving thoughts to share, grieving experiences to probe, and the whole spectrum of other experiences that our lives hold. 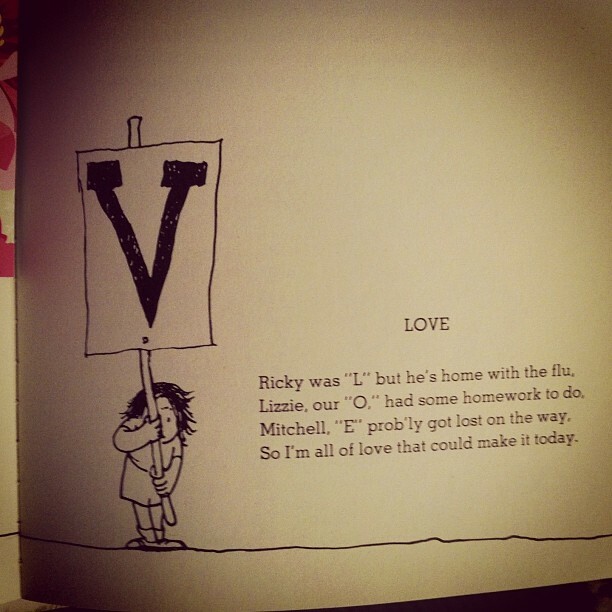 My 5 year old and I often read from a book of Shel Silverstein poems at his bedtime, not going in order but jumping around to whatever poems strike his fancy that day. It’s a big book, and each night when we wrap up, he flips through and then uses his “Vanessa bookmark” to mark a new starting point for the next read. This was his choice a few weeks back. Sending much love and a big hug from your long-distance next door neighbor! I was wondering… And hoping that your silence would help you gather the strength and grace to continue. Thank you… From the depths of my heart. What you choose to share, and how you choose to share it are profoundly and slowly changing my life forever… As I too endeavor to learn to live sincerely. When you made the statement about a silent disbelief I too can relate. My mom had stage 4 breast cancer and I knew it was coming, but when it did I was not prepared at all. It’s like you think most of them are already gone, but when they die you realize how much of them was still there. Your writings have helped me through some really rough times and I want to say THANK YOU!!! There are so many things that I went through also, and it helps hearing about your experience. My thoughts are with you. (((Hug))) You sent me a card today. I am so happy to see that you are writing. To know, that, a few says ago, you were thinking of me,is sooooo special. Because,it let’s me know that your not immersed in grief. ( I’m a mom, I worried) I have hope, that my children will be ok when I am gone. That their middle will be ok too. Thank you for sharing your lives with me. It means so much! ( please excuse fuzzy non-sensical reply…sometimes the pain meds make me loopy) I hope you can understand how much you are touching my life, I am somehow envious and in awe all at the same time.